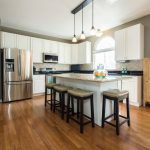 Home » What kitchens styles go with what flooring? How to pick the best kitchen materials, styles and colours for polished concrete, timber and tiled floors. Before you custom design the kitchen of your dreams with goFlatpacks, it is a good idea to think through how it will look once installed with your flooring as a backdrop. 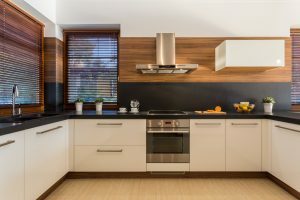 Some kitchens styles can look great in the showroom or in professionally shot photos, but it can be disappointing once you see the same kitchen come into being in your own home. The problem can be that the colours and materials that pair well with timber floorboards can look bland when polished concrete or tiles come into play, or that the timber style kitchen you fell in love with clashes in a major way with the tones in your timber floors. Keep in mind these helpful tips below when planning your DIY custom kitchen cabinetry using goFlatpacks. 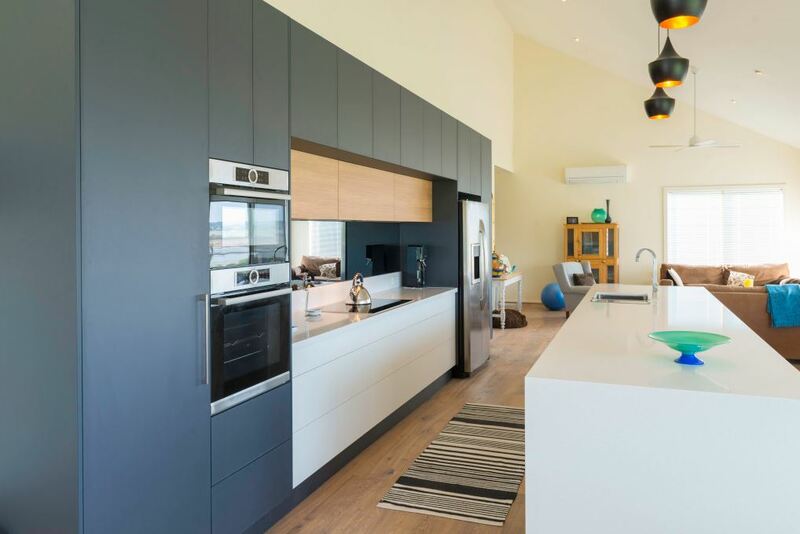 Polished concrete is the material of choice for many new homes and contemporary renovations, but if a kitchen is part of the equation, be sure to pick a design that makes both the flooring and kitchen stand out. The materials and colours you use in your kitchen provide an opportunity to warm up the coolness and functional feel of concrete. Using rich tones in a timber kitchen will balance out the grey floor. Whilst natural timber works brilliantly with polished concrete, black cabinetry gives a depth and dramatic feel. When it comes to appliances, stainless steel is a natural pairing for concrete floors. Concerned about the streaks? Consider black appliances instead. Timber isn’t the only way to bring warmth into a polished concrete zone. The warm tones in exposed brick can do the work for you, and bring a raw, industrial edge to the space. If you’d prefer a sleek design without timber or brick dominating the scene, consider colour to stop concrete from making the space feel cold. Yellow, red, and orange are fail-proof choices – concrete floors provide a great neutral backdrop for bright colours to shine. Introduce a colour in the form of kitchen stools and accessories and you can easily transform the look when you need a change. If you’re convinced a sleek, white kitchen is still for you, you’ll need to bring it down to earth for it to work well with concrete. Small touches of natural timber can prevent it from feeling sterile Use wooden stools and decorate with a wooden bread board, wooden tray or even wooden spoons. Displaying fruit, leafy herbs and flowers can breathe life into any kitchen, no matter how minimalist or industrial its design. Timber flooring goes with pretty much any kitchen style. I you were to choose a sleek or traditional kitchen design you could stick with one colour all the way or choose a different upper cabinet to the base cabinets. Pairing timber in your kitchen with timber floors doesn’t have the same cringe factor as denim on denim. Blocks of white prevent timber overload and having touches of timber in shelving, artwork frames and stools will tie the whole look together. Just be sure the tones of timber flooring and timber used in the kitchen don’t clash. Using grey-toned timber or plywood in the kitchen, for example, can make a warm-toned floor look too golden. Bring a little depth to a white kitchen by painting the walls behind open-shelving black. Bring balance to the space by adding black elsewhere such as a black rug beneath the dining table or having black dining chairs. Timber flooring gives you just the excuse you need to introduce a little luxury into your life. Marble (or marble-look) bench tops and splash backs will take your kitchen upmarket. Solid timber floors have many pros, including their ability to be retained and refinished during a renovation, adding warmth, beauty and value to a home. However, they do require regular maintenance to keep them looking their best, which can seem like a bit of a con to some homeowners. Investigate the many different styles of wooden floors to find the one that best fits your requirements. 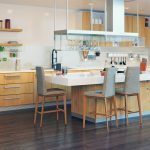 While there is a fair amount of contention about whether laminate floors are suitable for the kitchen, they do seem to be a perennial favourite, particularly wood-look laminate, for those with budgetary concerns. With the high-quality finishes now available in laminate, it’s generally quite difficult to tell the difference between wood-look and genuine wood. Because of this, the same colour- and material-pairing rules apply here as with real timber flooring: pretty much anything goes, if you’re not using clashing timber tones. Tiles give you the easy-clean benefit of a polished concrete floor without the hefty price tag, and can accommodate minimalist designs, glossy cabinet finishes and mirrored splash backs with ease. Dark brown timber or veneer can add depth to a kitchen that has tiled flooring without it being as harsh as black. Tiled floors present real freedom when it comes to kitchen materials, style and colour. Traditional kitchens fit far better with a tiled floor or timber, but it’s a style that doesn’t easily suit polished concrete floors. Classic black and white tiled floors never go out of style and work well with the charm of a provincial style kitchen. There’s no need to be too plain when it comes to a tiled floor but if you go the busy route, scale back the colours and materials in your kitchen. Tiled floors allow you to add colour freely on splash backs or kitchen cabinets – the more contemporary the style of tiles, the more you can go choose bright colours. Mosaic tiles can also add some sophistication as well as colour to your kitchen splash backs. Download our free goFlatpacks catalogue and planning guide to get you started!